The decorative potential of lacquer has been exploited in Japan since the sixth century, in a variety of styles and techniques. Long admired for their durability and excellent finish, beautifully decorated lacquer objects were used as votive offerings in temples and as luxury items by the nobility. With the rise of a middle class in the Momoyama period (1573–1615), lacquer was put to new purposes. 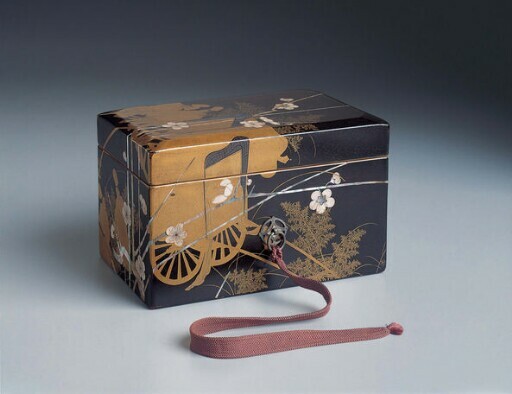 Among the new, practical lacquer items to appear were portable boxes in which the decoration continues from the lid and around the sides of the box, creating a harmony of form and decoration. In the Edo period (1615–1868), the working of lacquer reached new levels of artistic and technical refinement. The decorative use of gold, lead, and mother-of-pearl and shell inlay in the scene of courtiers, carts, and blossoms on this box exemplifies the sophistication of design that Edo lacquerwares had attained. The scene depicted on the exterior of the box probably comes from the Tale of Genji, the famous Heian-period romantic novel written by Lady Murasaki Shikibu (c. 973–c. 1015). The specific subject is difficult to determine, but the prominence of the motif of bullock carts suggests that it might have been inspired by the episode “Karuma arasoi” (Battle of the Carts). purchased by Kimbell Art Foundation, Fort Worth, 1976.